In the United States, golf score-keeping rules are governed by the USGA. You are ready to begin a round of golf and you have been designated the "marker" (or "scorer"), the person to keep the scores on the scorecard. Now what? Read on for some guidelines and suggestions for both competitive and personal scorekeeping. Scoring is based on the type of golf game you are playing and varies with strokeplay (also called medalplay), matchplay, best ball, scramble, stableford and other formats. This article will address the most common format, strokeplay. Acquaint yourself with the scorecard. Normally, a vertical column is provided for each of the 18 holes with a subtotal column for each 9-hole score (usually referred to as "out" and "in" that refer to the course's front and back nines, respectively) and a total column for the 18-hole score. Horizontally will be the yardage for each hole, with a row for each set of tees. The yardage is longer for the mens tees than the womens, and for the back tees than the middle and front. There will also be a row for the hole handicaps (1-18). The lower the number, the more difficult the hole compared to the others. The #1 handicap hole is the most difficult, and the #18 the easiest. The empty horizontal rows are for the marker to use for scoring. Determine whether you are playing competitively (for score) or simply for fun and practice. Even if you are playing for fun or practice, you should keep score. However, you may also wish to use the scorecard to track your shots for game-improvement purposes. Score strokeplay via the traditional method. The traditional method, also used for competitive golf, is to simply write the number of strokes, including penalties, for each hole in the space for that hole. The individual hole scores are subtotaled for each 9-hole half of the course, and the subtotals are added together to determine the 18-hole score. Use symbols if you would like to track stroke scores relative to par. Traditionally, circles are used to indicate below par, and squares are used to indicate above par. Draw a circle around the score for a birdie (one under par) or a square around the score for a bogey (one over par). Use a double circle for an eagle (two under par, which is rare among average golfers) or a double square for a double bogey. This is not practical for beginners because you will likely have no circles but multiple squares, which will make a mess of the card. Understand gross and net scores. Competitive golf can be based on gross scores, net scores or both to determine the winners. Gross is the actual 18-hole total, as described above. 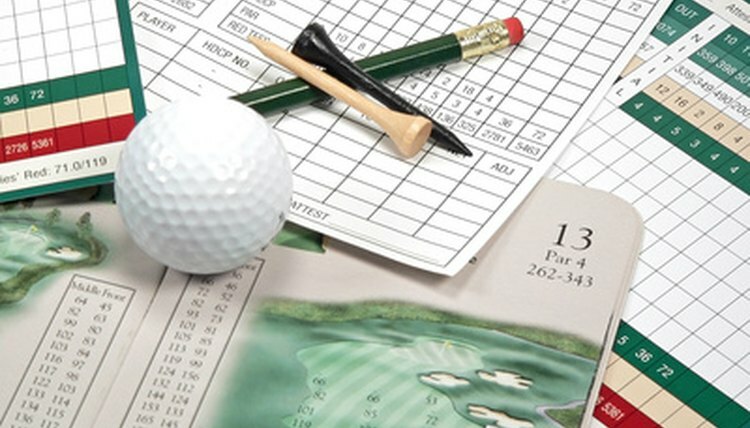 Net scores allow for the player's official handicap that is subtracted from the gross score to determine the net score. If a player has a gross score of 88 and a handicap of 15, the player's net score is 73 (88 - 15). The last two vertical columns on a scorecard normally provide the space for this calculation. Score strokeplay relative to par. Each hole is scored based on the strokes, including penalties, over (+) or below (-) par for that hole. If the hole is a par 4, and the total strokes are 6, the score is +2 (2 over par) and that is written in the space for that hole. The + and - scores are then subtotaled for each nine, and the subtotals are added to determine the 18-hole strokes relative to par. If par for the course is 72 and the 18-hole total is +16, the actual score is 88 (72 + 16). Track your stroke statistics for game-improvement reference when you use your scorecard for your personal use and not for a competitive event. For each hole, record at least the number of putts and the number of penalty strokes. You can also note when you hit the fairway with your tee shot, when you reach the green in regulation and the number of strokes to escape from hazards. These statistics will help you understand the strengths and weaknesses of your game so you know where to concentrate your practice efforts. Complete the card by filling in the date and providing signatures in the spaces provided at the bottom of the card. In competitive golf, the marker must sign and another player must attest (sign to indicate agreement with the marker).